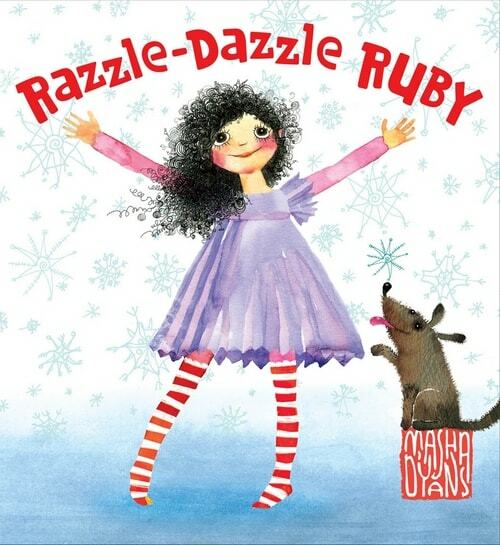 Razzle Dazzle Ruby can make the ordinary extraordinary! Come skate on a shimmering pond, roll a giant snowball, sled down a snowy hill, and create soaring snow angels with her as she becomes a snow queen and transforms a typical winter day into a gleaming-beaming fairy tale. 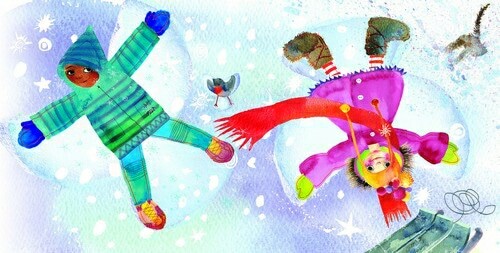 Masha D’yans is an award-winning artist. Her line of greeting cards, clothing, and home décor, featuring her alluring artwork, are sold at Target, Macy’s, Urban Outfitters, Nordstrom, as well as other major retailers and smaller specialty shops. Originally from St. Petersburg, Russia, and classically trained at the St. Petersburg Academy of Art Lyceum and subsequently at Cooper Union in New York City, she now lives and works in Manhattan. Razzle-Dazzle Ruby is her first book. Pair of red & white striped tights! Become a fan of LAB’s Facebook Page. Then leave a comment on the wall saying you love the $50 Visa card from Razzle Dazzle Ruby giveaway. Tweet this message: “Hope I win the $50 Visa card from Razzle Dazzle Ruby giveaway from ladyandtheblog.com (@verasweeney). RT to Enter #contest #giveaway”. Leave a comment “Hope I win the $50 Visa card from Razzle Dazzle Ruby giveaway from ladyandtheblog.com (@verasweeney).” on the sneak peek video here. Prizing & sample courtesy of Scholastic. Prizing value: Book $17.99, Tights $10.00, Recommended ages: 4-8. Giveaway open to US mailing addresses only. I entered my name in the contest form, thanks! currently subscribed to your newsletter, thanks so much! I entered my email on the contest entry form! I follow you on Networked Blogs (Sheila Korman)! I entered my email on the contest entry form. Thanks for the chance to win! I entered my name on your form. Congrats! You are the winner!! This sounds like a book my daughter would love to read! I would love the $50 Visa Card! Thanks for the chance!